The Hamiltonian formulation calculates phase resolved waves in a dimension-reduced way (Boussinesq with exact or optimized dispersion); the interior fluid motion can be recovered in a post-processing step. The explicit time evolution with automatic time step conserves the approximate energy exactly and avoids instabilities and unwanted dissipation. 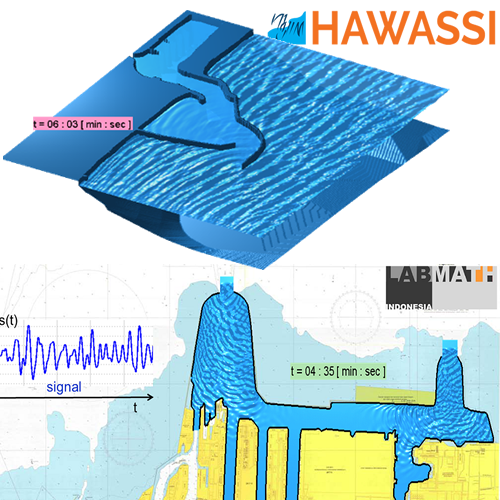 Wave-Ship-Structure Interaction refers to waves affected by bathymetry, harbour walls, breakwaters, etc. (Wave-ship interactions will become available in later versions). 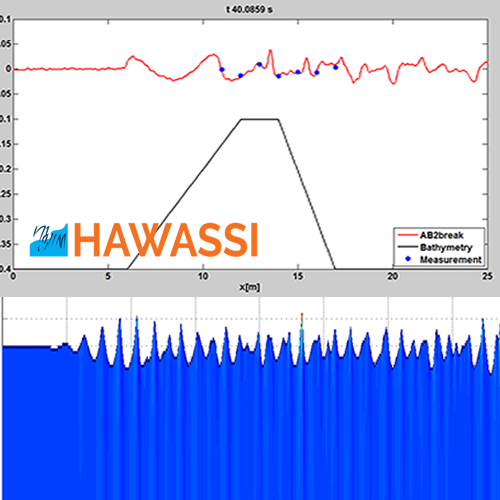 An introduction to the HAWASSI software can be read in the following lecture note: Water Wave Modelling & Simulation by LabMath-Indonesia. For simulations of long-crested (1HD) high, very nonlinear, breaking or non-breaking waves with exact dispersion in wave tanks. For scholarly research, different dispersion relations can be used or specified. For simulations of long (1HD) and short crested waves (2HD) with tailor-made dispersion properties in coastal areas with harbours and strongly varying bathymetry, and for simulation of oceanic waves.